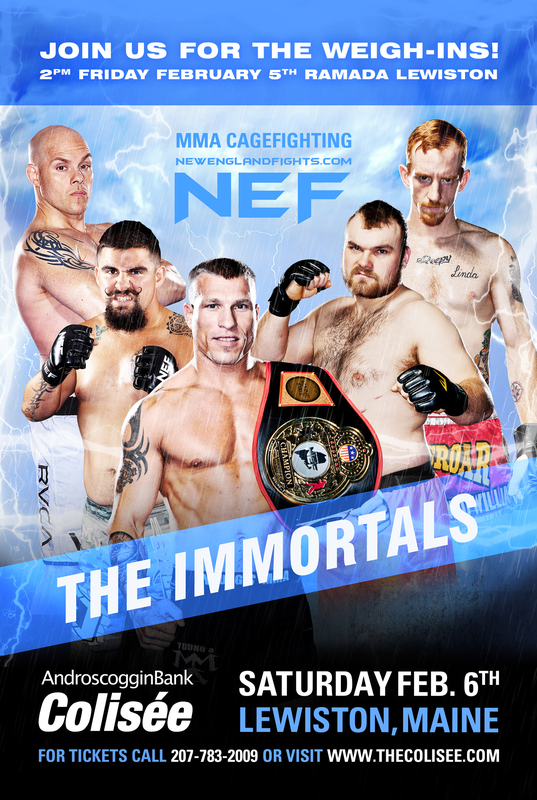 FOR IMMEDIATE RELEASE: Lewiston, Maine (February 3, 2016) – New England Fights (NEF), America’s number-one regional fight promotion, will hold its next event, “NEF 21: THE IMMORTALS” this Saturday, February 6, 2016 at the Androscoggin Bank Colisée in Lewiston, Maine. The event will feature both mixed-martial-arts (MMA) and professional boxing bouts with an MMA cage and a boxing ring set up side-by-side. Earlier today, the promotion announced that it would hold the event weigh-in this Friday, February 5, 2016, at 2:00 pm EST at the Ramada Hotel & Conference Center. The Ramada is located at 490 Pleasant Street in Lewiston, Maine. Weigh-ins are open to the public and free to attend. All of the fighters competing on Saturday night will be at the weigh-in, including MMA headliners Bruce “Pretty Boy” Boyington (12-8) and Jon Lemke (5-3), as well as boxing main event participants Brandon “The Cannon” Berry (10-1) and Tollison Lewis (2-0). Fans and press are encouraged to attend. For those unable to make it to the Ramada on Friday, weigh-ins will be streamed live on the NEF Youtube page at www.Youtube.com/nefmma.